The reason that choose this nugget was because of how true it is. Now a days, with the advancement of technology everything can be found online, from the phone number of a local restaurant to the the purchase of a car. Almost anything can be done online and having a computer has become a necessary thing in everyday life in order to stay up to date with everything. It says that computers are simply necessary and enjoyable part of life, like food and books. But don’t we need food in order to survive, yes it is true that we don’t need to eat for a week or two but we eventually need food. Just like how you might not need a computer right now but in a year or so you need a computer in order to thrive in the type of society that we live in. A society where everything is changing from manual to mechanical. 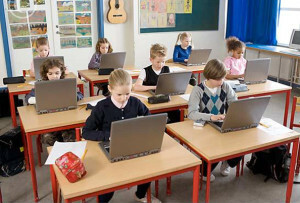 When I was growing up, it was rare for a child to have a computer but the moment I entered high school, I learned that I needed a laptop in order to do my homework. Now a days kids are early has middle school needs to purchase a laptop before school starts and they are required to have the laptops with them at all times during school hours. Also, in order to be a competitive person in whatever field that you are studying or currently in, it is imperative that you stay on top of everything, whether it be on the latest trends, the newest advancements in your field and so on. And the best and effective way to achieve this is through a computer, yes you can go through newspapers and find articles in magazines but that will take way to long, instead using a computer will help you find what you are searching for faster and more effective. In the last part of the nugget it mentions that not having a computer is computer illiteracy which can be dangerous and foolish. The computer is the stepping stone to every single other technological advancement out. If you don’t know how to use something as basic as a computer, then how will you be able to use other technology? 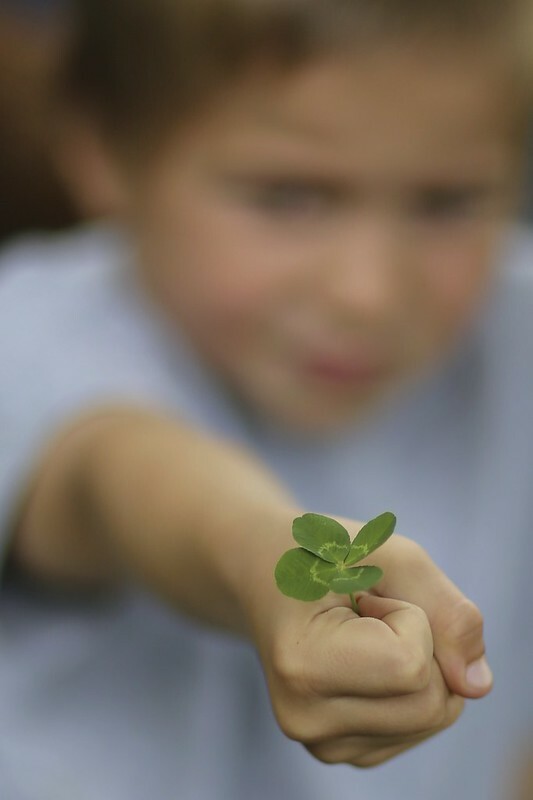 Like mentioned earlier, you don’t need a computer to survive and be the best that you can been in society, however getting and learning how to use a computer will help you ten folds and will help you to become more successful in the future. After looking at various different posts from various students, I started to think on what I wanted to focus my project on, and the one thing that stuck to me no matter how many different topics I looked into was artificial intelligence. Over the past decade, artificial intelligence has made great leaps from the creation of the first humanoid robot to creation of siri in our iPhones. The reason that AI was of interest to me was because of how we can possibly create robots to carry out man’s work, or on how we can create technology that can speak and understand various languages. Another reason why I want to focus on Artificial Intelligence is because of what I am studying. I have just finished my first year at VCU with the major in biology and a concentration on Pre-Med and I hope that in the future I will become a pediatric surgeon. I feel that with the help of AI the field of medicine and especially surgery can advance ten folds and become more accurate. 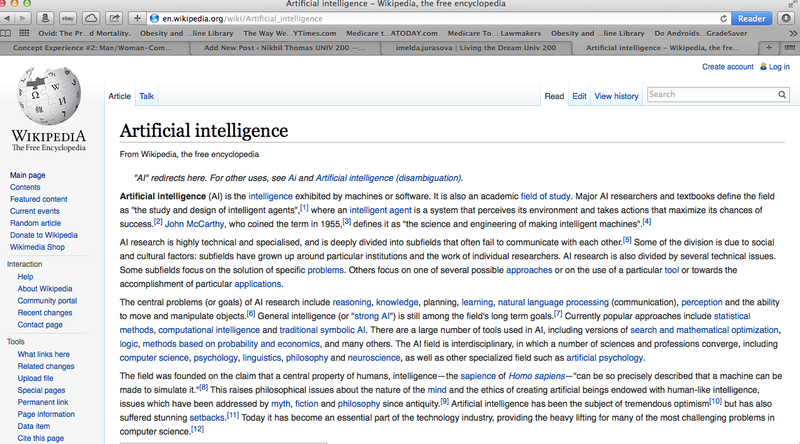 My topic for my project will be; How will Artificial Intelligence help the future and in what aspect? 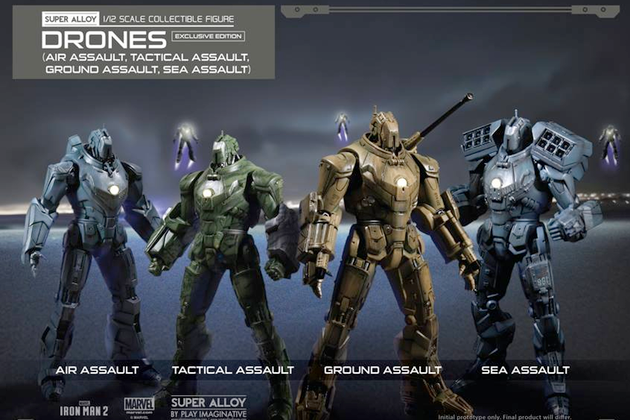 And is their a potential downside to the evolution of Artificial Intelligence? Once I picked my topic for my project, I started to do vast amount of research to find good and informative sources. In the first source, titled, ” Artificial Intelligence: A Virtual Reality?” stated that how with so many advancements in technology, Artificial Intelligence may become more and more part of society at a faster rate than what was previously suggested. Also many people think that AI will be a part of us and completely dependent on humans, while others fear that with the increase of advancement, AI’s will start to have more control of themselves and be more and more independent which can cause them to rebel against humans. Another article titled, ” Artificial Intelligence” states that in order to approach the creation of AI, you can approach in two different ways, a classical approach in which we design the AI and we tell the AI what to do and only to do those tasks nothing else. Another way to approach is through a connectionist approach in which we build the AI but we allow the AI to develop to learn on its own what to do and what not do. The connectionist approach allows the AI’s to be more free. One other article that I found, titled ” The Creation of Artificial Cells and Artificial Intelligence.” states that with the creation of these Artificial Cells everything can change. Meaning that AI’s would not need humans for repairs if they have their own cells, they can slowly heal themselves making them less dependent on us, and allowing them more freedom. Is this topic to general? What are some key points that should be discussed when discussing the evolution of AI in the future? How much knowledge on AI do you have? Would this topic create a lot of discussion? How so? Through out this past week, we have started using a bookmarking tool known as Diigo, and the Diigo program has a relation to Engelbart’s writing known as “Augmenting Human Intellect: A Conceptual Framework” In his writing, Engelbart states about a dynamo knowledge repository which has a close relation to the purpose of the Diigo, which can help us further understand Engelbart’s vision. While reading Engelbart’s article you can make the link that how the Diigo can be relatable to his writing. One way that the Diigo is relatable is by it’s similarity to the Memex device. The Memex device is a device that helps stores someone’s books, records, etc. and it is organized in a fashion that allows speed. Just like the Memex device, Diigo allows people to bookmark different websites, documents or anything else that can be found online. 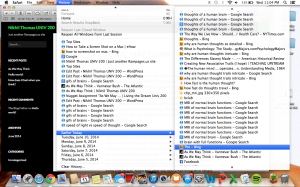 And it allows others to see what someone had bookmarked. During Engelbart’s article he relates to his thinking idea to that of a kernel. For me a perfect metaphor that relates to my thinking process would be a flower seed. The reason for this is because the flower seed is just an idea but the seed cannot thrive on its on. It needs help from other sources, such as water, soil, nutrients, and sunlight, with out different elements coming into play the seed will just be a seed and nothing else. Over the past week, I have been doing research into finding good articles that allow me to expand my idea of AI and to understand them more deeply. Because I’ve been finding sources on AI my idea has been expanding. 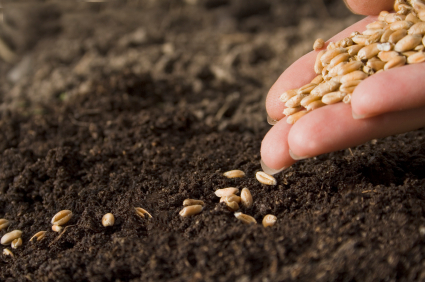 So when relating to my metaphor, since I have been adding soil and water to the seed it was started to germinate. I have a long way to go before it becomes a flower, but I know that I am on the right path. By adding “soil”, “water” and so on to my seed I have been able to learn new things, such as the ideology behind AI starts with computer science and that computer science started in 1642 with the invention of the Pascal Calculators created by Blaise Pascal. Because of these types of information, my seed is able to grow more and more and spread it roots out further getting in new information every time. When I came upon this section while reading the article titled “Augmenting Human Intellect” it immediately caught my eye. I feel that this “nugget” is trying to convey that for someone to make a difference in the world they don’t need to come from a family that is made of money or from a family that has a high status in society. But instead, for a person to make a an effect on the world they should use the information that they can get from the world around and if they can’t get certain resources they should overcome that hurdle and have that drive in order to achieve what they need to achieve. If the face issues in order to get their ideas out to the world due to bigger forces such as the government, or the church they should do what they can to get their idea out to the world. Throughout history, their are many examples of individuals who did’t have everything in front of them, but they still managed to pull through and make a difference. A person that comes to my mind right away is Charles Darwin. We all know that Charles Darwin changed the ideology on where we as humans come from and how we evolved. This was known as his theory of evolution and all of this took place during his voyage, during his voyage his published his famous book, “The Origin of Species by Means of Natural Selection”. This book showed all of his work with different species, such as the finches and also had the research that showed how each finch related to each other. When publishing this book he faced a huge hurdle from the Church. During that time everyone believed that God created the world and that he created man and every creature. When he faced the hurdle, he could have stopped and not questioned the Church. However, Darwin knew that he was right and we going to do everything in his power so that his book can be published and shown to the public. Because of that the world was able to understand the idea of evolution and because of him more people where able to do more research into the idea. While reading the article “Man-Computer Symbiosis” had me thinking on various effect that computer and technology can have an effect on human life. And while reading everyone’s nugget, I felt that the main thing that I kept seeing was the idea of AI better known as artificial intelligence. So I decided to explore deeper into artificial intelligence. 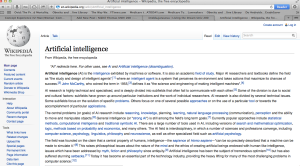 I found out that researches define this field as the study and design of intelligent agents. 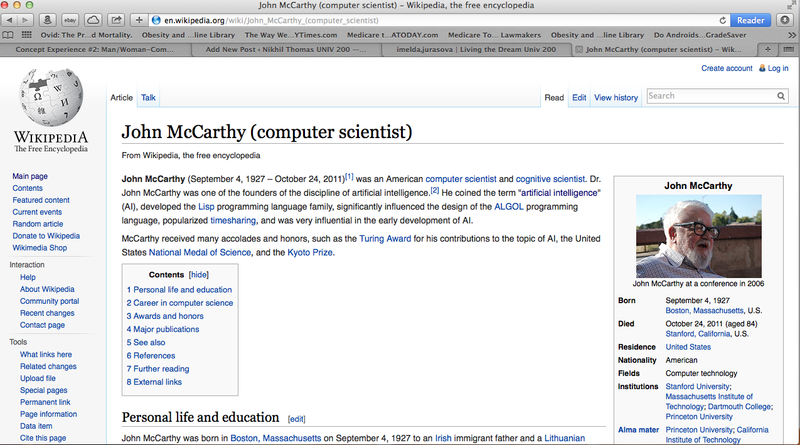 Also while reading I learned that the father of artificial intelligence was John McCarthy, which intrigued me to find out who John McCarthy was. 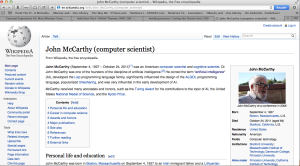 I learned that John McCarthy was born in September 4, 1927 who grew up to pursue a career in computer science as well as being a professor at Stanford. One thing that intrigued me about John McCarthy was his career choice of computer science. 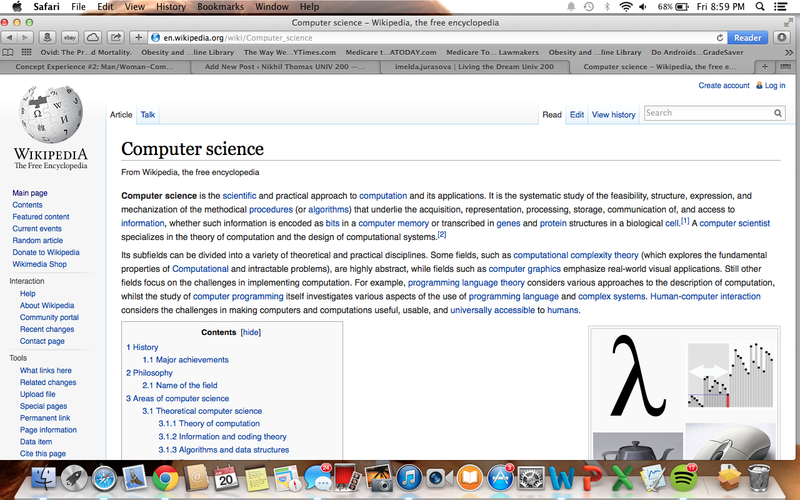 So I decided to do some research on computer science. 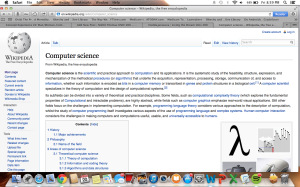 I learned that computer science is the scientific and particle approach to computation. 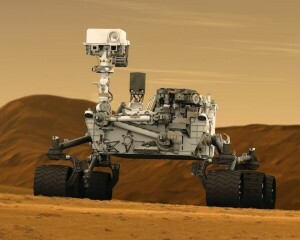 Because of computer science many achievements have been reached such as programming language, computer graphics, simulations and of course artificial intelligence. 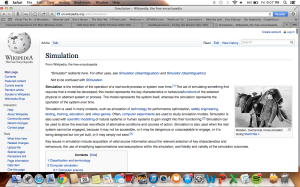 But one thing that intrigued me about computer science was the impact on simulations, so I decided to do a little more research into simulation. 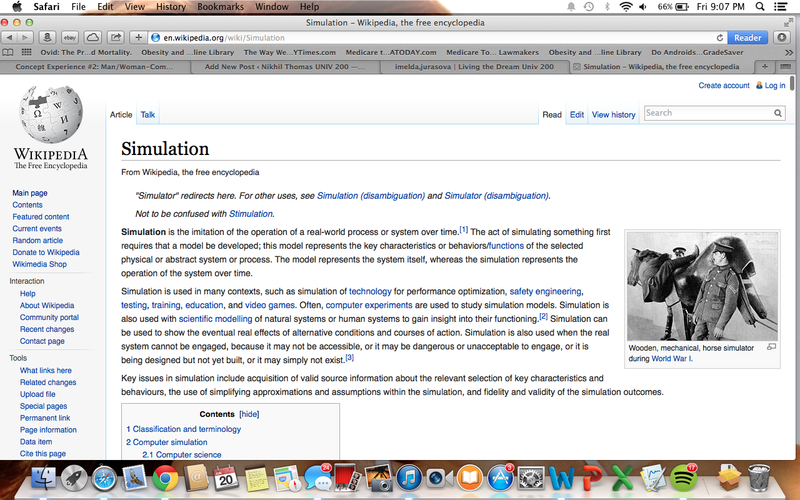 I learned that simulation is used in many various aspects such as testing, training, education, and even video games. Also that many military uses simulations in order to test out new technology and weapons. After I satisfied my knowledge for simulation I went back to computer science and I found out that Blaise Pascal invented the world’s first mechanical calculator. 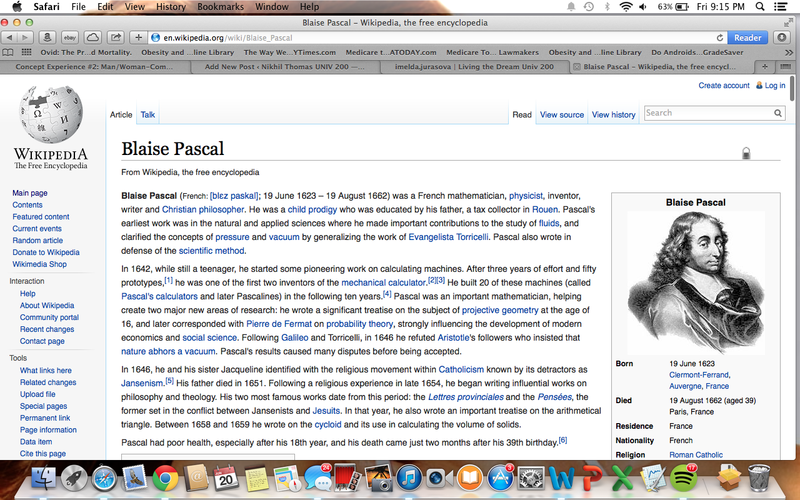 I then decided to study more on Blaise Pascal. Blaise Pascal was a french mathematician, physicist, inventor and also a Christian philosopher. He lived from 1623 to 1662. When he was a teenager he started his work on the production of his mechanical calculator, after multiple trial and errors and finally built a proper working calculator and he only built 20 of these calculators which were later called Pascal’s calculators. 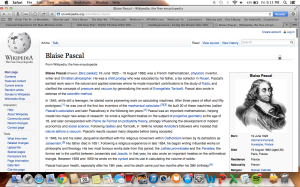 Because of Pascal and his various inventions, it paved the road to many different inventions and also the idea of computer science which has allowed for the inventions of many other concepts such simulations, video games and of course artificial intelligence. While reading “Man-Computer Symbiosis”, I was very intrigued by a variety of different nuggets, however out of all the nuggets, this particular nugget stood out to me. It’s kinda scary that around 10 to 12 years ago technology was just starting to make a huge impact in the world that we live in. 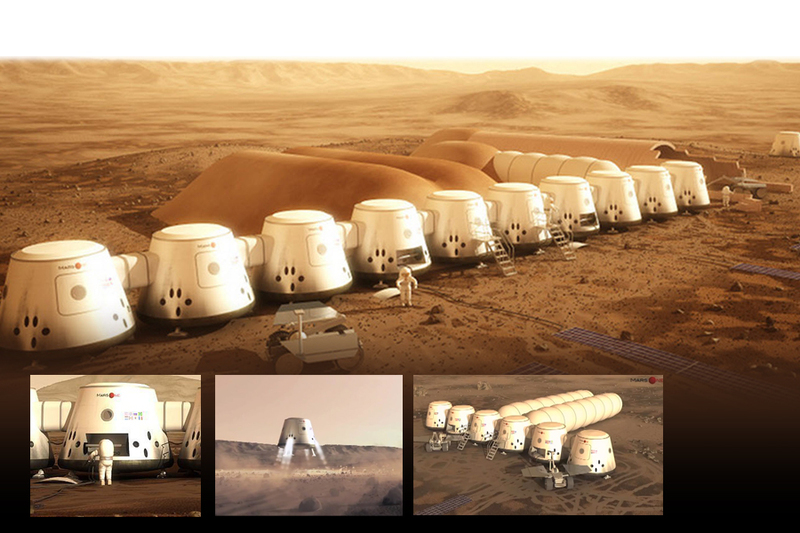 For example, in 2004 the Mars Rover landed on Mars and now in the year 2014 we are starting to make to plans to send humans to live on Mars. It is shocking how technology can advance in such a short amount of time, and makes you think how far will it advance ten years from now. One main thing that the nugget addressed is how that in the recent years technology have slowly replaced the roles of humans. Instead of humans doing work it will be technology and the remaining humans that have not been replaced yet is because they are to help the guide the machines to take over their role as well. When I was reading gerellmalazarte‘s post one thing that was pointed out was on how fast and effective machines are compared to humans and that is true. Also his link with Iron Man got me thinking on how in Iron Man 2 we see a scene in where they revel drone relating to the different branches of the Military and this is because the drones are more effective than humans, they will make fewer mistakes and they will be more effective than humans. One thing that this nugget reminded me of was that of the huge changes that are happening within Costco. I do not know if that is happening at every Costco, but that the Costco nearest to my house, when you walk in, you can go to a kiosk in which you receive a handheld scanner. As you go throughout the store picking out items you are planning to buy you use the scanner to scan the barcode and the information stays within the scanner. When you go to the checkout line you take out your scanner and you scan your scanner and every single item that you scanned shows up on the monitor and you just pay for it and your done. This just shows how machines are replacing humans instead of having cashiers we now have handheld scanners we just makes everything more effective and faster. They still have cashiers at these stations but only to make sure that the machines are working. AI technology is one of the main things that many companies have been focusing on for the past the couple of years and the the biggest company that has invested so much time and money on AI tech is Apple with the creation of Siri. Just An Average Guy states in his post on how Siri has evolved to respond to our demands and recently has developed Siri in order to respond in different languages. AI technology is the voice of machines, and the mind of the machines have already been created and now the body for these machines are slowly taking place and they are being produced in all various shapes and sizes. Justint stated in his post, on how that because of technology it allows humans to focus more on bigger issues and for us to leave the calculations and so on to the machines, but I feel that when we humans are the ones doing the calculations it allows our brain to think more and it helps keep our brain active, if we leave all the hard stuff to the machines then over time we will start to see our brain loose the power that it used to have before machines. When I was reading imelda-jurasova‘s post on the bringing together of man of machine she made a point on how one side needs to the other side in order to live. I felt that with all the advances that has happened to technology, it is far more superior to man and the main purpose to technology is to learn and to adapt. If man and machine were to be brought together as one I feel that over time machine will take control since they are more more powerful than we are. Thus making the cyborg 100% machine and only using the human side as a coat. I feel that within the next 10 to 15 years the usage of technology to replace human work will skyrocket since investing in machines is more cheaper and also more effective and because of this many more problems will start to rise such as unemployment and so on. Social media has become a huge part of many young teens and young adults that it has become one of the primary ways in which many people communicate with each other. For me personally I love social media, I find it interesting that you can connect to people all over the world from topics ranging from sports to world events. I personally have a Facebook account, an Instagram account, as well as a Twitter account. Out of all the three different social media sites that I use, I find myself favoring Twitter over the other two. The reason for this is because Twitter allows a better connectivity between other individuals and with the rest of the world. The one thing that I enjoy about twitter is how much you can say in one tweet. Unlike Facebook where you can write a novel, Twitter does not allow that, it instead limits to an individual to 140 characters peer tweet which allows others to get right to the point of their tweets. Also, another thing that I like about Twitter is how we can can connect with famous celebrities and see how they live their life. I also like on how Twitter allows people to post pictures as well as videos into their tweets which opens a whole new world. One thing that I have been really impressed with recently is that how Twitter has integrated the World Cup into twitter. When I logged onto my twitter account this morning I saw on my side bar all the different games that were to be played today. 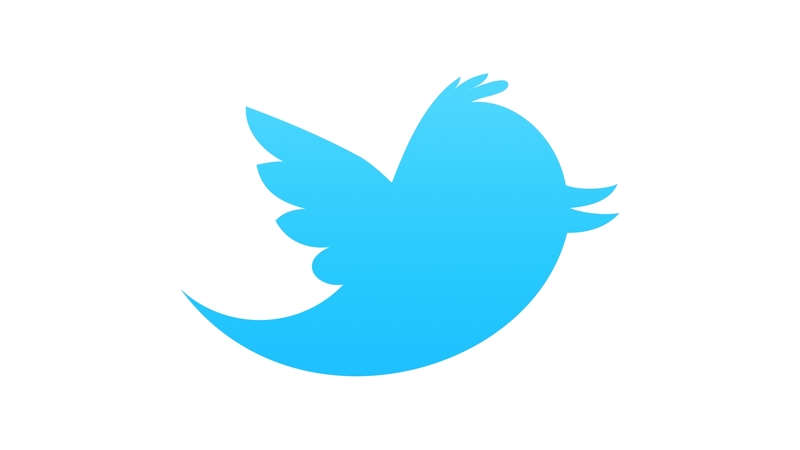 Twitter has also increased the flow of information around the world. When the Sandy Hook shooting took place everyone on the Twitter world learned about the horrible incident within a matter of minutes before the media got a hold of it. This just shows on how fast information can travel and it also shows on how effective it can be. Also, because of Twitter different movements were able to gain popularity such as Kony2012 which was a initiative to help the kids in Africa who are forced to fight. Twitter has allowed many people to connect with each other! Facebook and Instagram and very good social media sites however they don’t allow enough connectivity to the world that Twitter does. When I started to write my nugget assignment, I was completely confused on which “nugget” I should choose from, since the article was long and that it contained more than a few “nuggets” which intrigued me. When I finally choose a nugget that really intrigued me and sparked my curiosity, I knew that this was the correct nugget for me to looker deeper into. At first it was hurdle to write my nugget, I did not know how to start my nugget so I decided to go on Facebook to get the juice flowing a little bit and I found couple of interesting articles on people that had brain injury and how it had impacted their memory and thought processing. I decided to go back to the article and reread couple of paragraphs above and below my nugget in order to get a better understanding of my specific nugget as well as to understand the bigger picture. 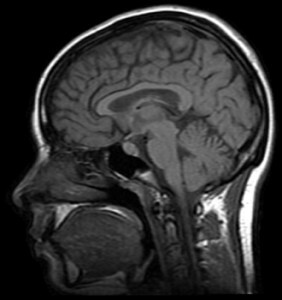 I then decided to google more information on the brain and the different functions that the brain has, as well as watch video that show patients undergoing an MRI while being tested on how they think, where they think, where they store their memory and so on. After writing some key information, I found myself stuck again, so I started to do more research on human thought patterns and human memory as well as where they are in the brain and on how it can impact a person’s life if these part of the brain were to get damaged. 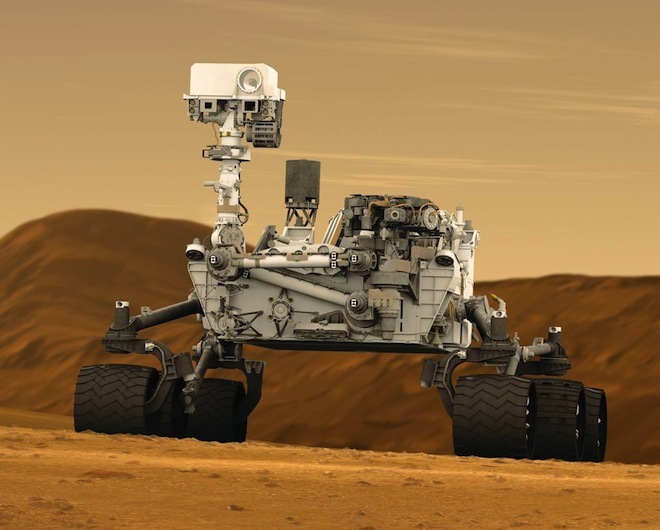 In my first blog, I stated that how my thinking process is related to the building of a car, that different parts must come together in order to make one product. Going through different search engines and websites I was able to pull important information that helped with my nugget. During my research I did find myself back on Facebook just scrolling through my timeline and this allowed me to just relax my brain again and after couple of minutes on Facebook I would resume my research and I could feel that my brain was fresh. My website history shows that a good amount of research as well as time in required in order to produce a well thought out response to a nugget! I was quite surprised on how much information the internet has on one small matter of the brain and on how much research has gone in to study human thought and memory. This passage in the article intrigued me because it states how our brain forms many different connections from just one thought. It’s crazy to think that our thoughts are just jumping from one to another by mutual connections. 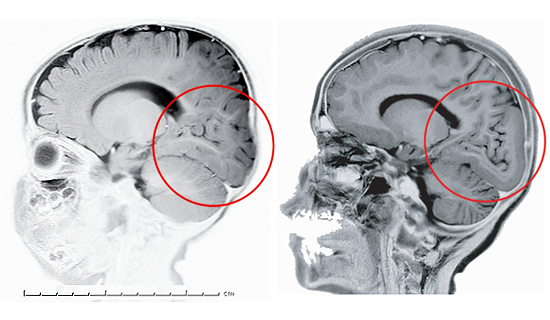 Human brains are fascinating and have yet to be completely mapped out. There is so much we don’t know about our brain and its potential. Our mind is full of thoughts that are just added from our previous thought. They’re all connected in some sort of way. Some thoughts are connected more than others. These thoughts connects to each other because they are carried by cells of the brain that have been connected to other various events and memories. Our memory is always changing due the fact that our brain is always moving so fast paced from the different thoughts. But sometimes, we don’t realize how fast our thoughts are moving. Thoughts are actually faster than the speed of light, and the proof includes deja vu. Deja vu is when your brain exceeds the speed of light and makes time twitch. The trails that our brain has from one thought to another is quite intricate. The complexity of them is far more than we can understand. The detail of the pictures, memories, and thoughts that we remember are so elaborate and clear because our minds sync every detail we tell it to remember. Crazy, huh?